Love marriage in Chandigarh and Punjab-Haryana region, however romantic and a matter of dreams, attracts unwanted attention. And when the match involves two individuals from two ‘incompatible’ castes, the couple is in for some extreme experiences. Granted the bleakness of the situation, the Indian law is in favor of the couples in this regard. Knowing your rights and living well within the limits of it will not only help you achieve a harmonious social life after marriage, it will also save you from unfortunate incidents. There was a time when caste was an important part of one’s identity. Society’s expectations and your duties were all defined by the caste you belonged to. The time, however, has changed a lot. Nowadays, an individual is an individual, caste or religion has little bearing on the duties and civil rights of the person. Just like love, law is blind, so your caste will never be a hindrance towards getting justice. If you and your partner are of legal marriage age (21 years and above for a boy, 18 years and above for a girl), then you have the legal right to choose your life partner. Ask the best advocate for love marriage in Chandigarh, he/she will have the law support your choice. Caste system in India is a matter of millennia and very string traditional legacy. So, when you choose to go for a socially incompatible match, you must realise that there will be social consequences. You can’t stop people from reacting in certain manner. Acceptance is your best weapon in facing the reality, within a certain limit. Likewise, if your relatives and parents ‘disown’ you from their property and family, there is hardly anything that you can do legally to mend the situation. The best you can do is to accept the financial constraints, if any and move towards a practical solution. Caste is often a matter of social distinction. So, if you ever face any threat or act of violence, please contact any good love marriage lawyer in Chandigarh. Try to convince and reason with your near and dear ones about the changed social realities of modern India. Now, an individual’s worth is measured by his/her education and capabilities. The social status attached to caste and religion is slowly but surely disintegrating because they have run their course of being useful in society. Also, you need to communicate that your marriage will not destroy your identity as a representative of your sect. Your beliefs will remain just the way you want them to be. Always have legal documentations of birth, marriage certificate, citizenship of your state, etc. These documents, as any love marriage advocate of Chandigarh High Court will tell you, will help you get justice done and protect you from violent outcomes. 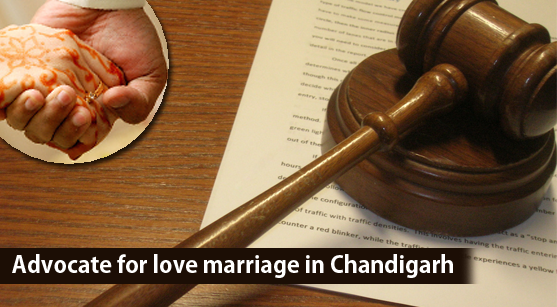 In case you wish to file a petition for protection, any good love marriage advocate Chandigarh has will help you get legal help.